Ecosystems. This package includes the lesson (student and teacher versions of the Power Point), and a student lesson handout as a word document. The Power Point is fun and and applicable. Buyer Comments: "This was absolutely perfect for my unit of study! My class loved the presentation!" "Excellent Power Point! The worksheet was great and made sure the students were paying attention!" "Great slideshow! 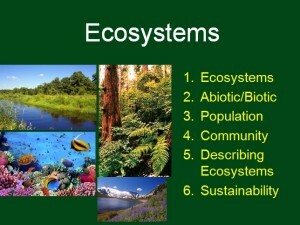 I wish I had known that there were other ecology slideshows before I purchased this one so that I could get the bundle." "This was very informative and helped with some of the vocabulary words the students were struggling with!" "A+!" "Loved the ppt. It was the perfect way to into/reinforce my life science unit. It helped the students with their understanding of a difficult issue."